This is a relatively new term first coined in the early 1980s. Those who know and appreciate good eats became known as foodies. In many ways the word replaced the more didactic description of food elitist or food critic. The word critic implies a harsh and narrow approach to such a delicate, sumptuous and personal expression, but the term elitist, is a little harder to replace. However, to be called a foodie is a little easier to swallow. Foodies don’t have to be great cooks – although many are. A real foodie won’t tolerate substandard ingredients, preparation or presentation – let alone poor flavor profiles in a dish. As a collective, this caliber of food lovers does have to share a higher quality of appreciation for great food. Would it be safe to say that most die-hard foodies are culinary snobs? Yes, and proud of it. Foodies don’t eat to simply nourish themselves, they eat as an adventure. With the world becoming smaller every day, more cultural influences have made their way into food markets and kitchens everywhere. This, of course, adds to the adventure. Trying new tastes and traveling to other countries through our pallets is not only trending, but becoming a sought after challenge. Fusing the flavors of Viet Nam and France or the spicy cuisine of central America with Great Britain bangers leaves the food lover wanting more. Food trends have enough world-wide fuel to keep them going indefinitely. Foodies are not defined by the consumption of any particular type of food either. They are the folks who love Mom and Pop diners and those who prefer 5-star dining at the Le Bernardin in New York City. One of the best emerging markets in the food industry are food trucks. 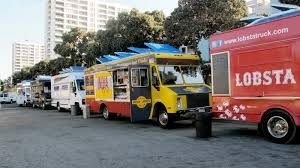 Yes, you can bet there are food trucks that serve better food than some brick and mortar establishments. It goes back to fresh flavors and primo ingredients, but also a unique statement of food carried off by the cook or chef behind the menu. I should mention that many a food truck eatery has graduated to the brick and mortar status from pure demand. When the word gets around about a particularly good dining spot – whether it’s on the curb or at the club, there is no stopping the intrepid foodie from finding it. Do you consider yourself a full-blown foodie or just someone who loves to eat? Does it matter where you get your grub? Leave a comment below and join the conversation.